Accessories for the Galileo Bioscience horizontal and vertical gel electrophoresis systems. Electrophoresis accessories include trays, combs, casting trays, and glass. 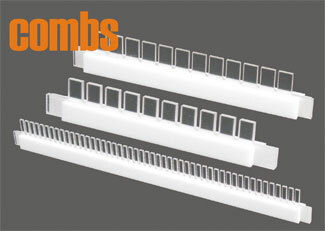 They are the perfect complement to new or existing systems. Galileo’s accessories fit into systems from many other manufacturers, such as Owl Scientific. The RapiCast gel caster can be used for casting up to three 7cm x 8 cm gels at once. Gel trays are not included. RapiCast 6 teeth gel comb, 1 mm thickness, for 0708 system. RapiCast 8 teeth gel comb, 1 mm thickness, for 0708 system. RapiCast 12 teeth gel comb, 1 mm thickness, for 0708 system. RapiCast 6 teeth gel comb, 1.5 mm thickness, for 0708 system. RapiCast 8 teeth gel comb, 1.5 mm thickness, for 0708 system. RapiCast 10 teeth gel comb, 1.5 mm thickness, for 0708 system. RapiCast 2 teeth preparative gel comb, 1.5 mm thickness, for 0708 system. RapiCast 12 teeth gel comb, 1.5 mm thickness, for 0708 system.